This is one of my very favorite church exit photos. Guests were throwing rice and confetti as the bride and groom dashed through the crowd, laughing. They're so happy and surrounded by love. 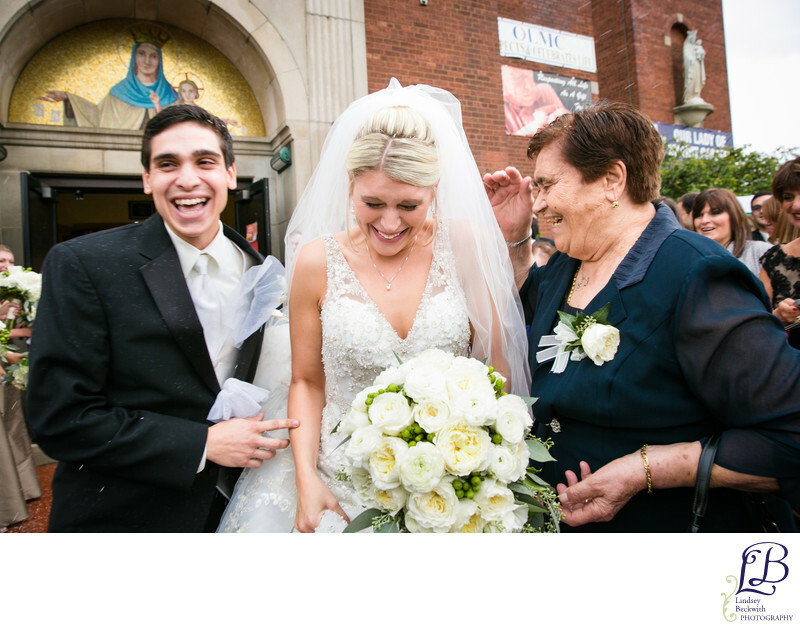 The groom's grandmother is laughing so hard, thrilled for her grandson on his wedding day. The bride's classic white bridal bouquet accentuates her wedding dress, and the groom's happy smiling face, with his hand delicately on her forearm, says more than I ever could. From here we went to the Cleveland Museum of Art for photos, and then on to their lavish wedding reception at the Old Courthouse. Our Lade of Mount Carmel wedding photographed by Cleveland wedding photographer Lindsey Beckwith.